Last training for 2015 – gift yourself a new start! 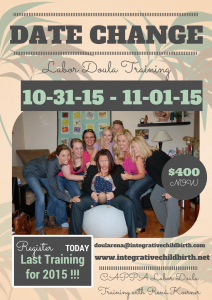 Passionate about Birth, helping Families and becoming a Doula? Now is the time, register for the CAPPA Labor Doula Training and begin your passionate journey of helping new families as they prepare for the arrival of their new baby, throughout pregnancy, the birth and immediate postpartum period! $400.00 for the training (this does not include CAPPA Membership fees, the CAPPA Academy fees or final processing fees). Please contact me directly so that I may guide you throughout – doularena@integrativechildbirth.com, RSVPing on fb does not count towards registration, your registration and seat are not confirmed until registration and payment have been received.